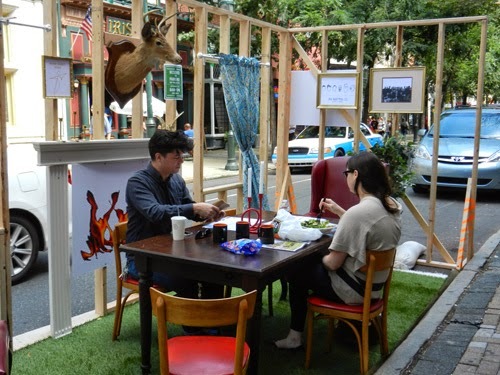 unless it happens to be PARK(ing) Day, an annual event where activists, artists, architects, and other citizens transform metered parking spaces into temporary pedestrian-friendly parks. 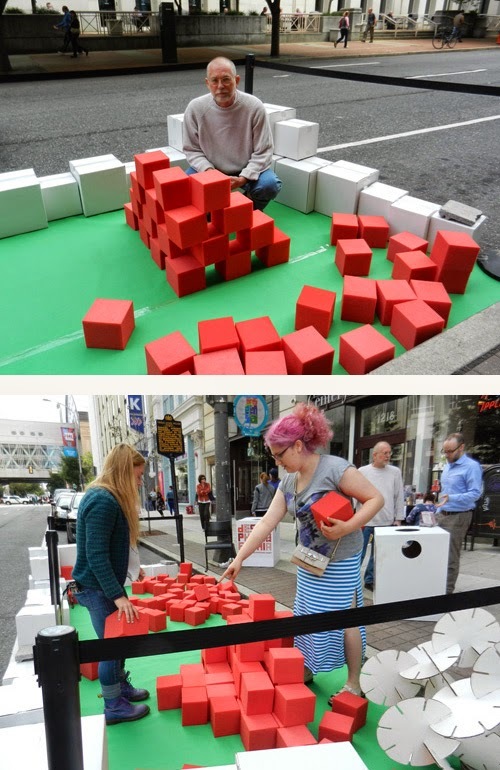 Then park(ing) can be fun! Launched in 2005 by Rebar, a San Francisco art and design studio, to raise awareness of the need for open green space in urban environments after discovering that more than 70% of San Francisco's downtown outdoor space was dedicated to the movement and storage of private vehicles, with only a small percentage of that space designated for public interest. It was on this day, November 16, nine years ago, when Rebar "leased" a parking space in downtown San Francisco by feeding coins into a two-hour meter and erected a PARK with sod, a bench, and a tree for humans to rest, relax, or do nothing... at least until the meter expired. When time ran out, the sod was rolled up, the bench and tree packed away, the street swept, and Rebar left the area, but not without leaving a lasting impression. 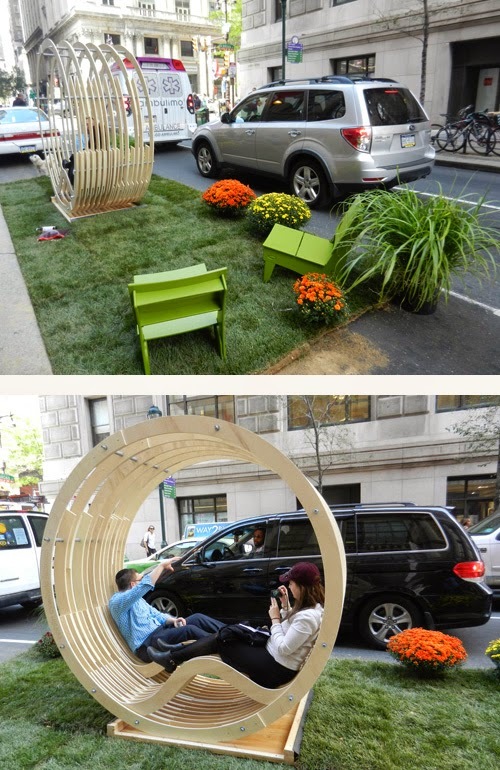 Today, PARK(ing) Day continues to be celebrated worldwide on the third Friday in September. This year the city of Philadelphia allocated some 40-50 parking spots, each 170 square feet, at no cost to participants interested in creating mini-parks or "parklets" to be used for public relaxation and enjoyment during the hours of 9 AM - 5 PM with the following restrictions: that barriers tall enough for drivers to see be erected between parks and traffic lanes, only one park per block, and no parks situated near corners. Other than that... if you can park a car in it, you can have a park in it. To avoid the hassle of parking, my husband Michael and I took a train into Center City's Jefferson Station, formerly Market East, less that a block from our first destination... a park sponsored by Philadelphia Center for Architecture at 12th and Arch Streets. The possible concept for this park: Design Can Be Fun. Here's Michael attempting to design something precise using imprecise floppy foam blocks as two women formulate their own plan. This park by PHLe/ patrike design workshop, made from boxes left over from a recent move, allowing small children to play in the street while crawling through a cardboard maze. And this one designed by Bohlin Cywinski Jackson Architects with grass, plants, benches, and a handcrafted circular rocking chair for relaxing and conversing with drivers in the traffic lane. Next by JKR Partners, LLC, a place to enjoy the comforts of home while outdoors with curtains, table, chairs, framed artwork, and a mounted deer. Watching these people enjoy lunch in their own park, made us hungry. We decided to head over to Little Nonna's, an Italian restaurant one block away, at 12th and Locust Streets, and dine in their outdoor garden, which is no bigger than two parking spaces, and resembles a mini-park with hanging laundry. Exiting the restaurant, we met K & T, two landscape design students. Their park, on south Syndenham Street, explores creativity by offering a variety of art materials for adults to draw, write, or color onto stretched plastic film... hopefully, rekindling a creative spirit that may have been lost after childhood. From here we walked a bit and found ourselves at 11th and Chestnut Streets in front of a park belonging to PLCMKR (PlaceMaker, an urban organization connecting people and place). The park was titled: Be Heard... a place to voice your opinions, likes, dislikes, as well as offer suggestions and solutions. After writing down your statement, a photo was taken and attached to a wooden crate for others to see. Here's Michael and one of his pet peeves. 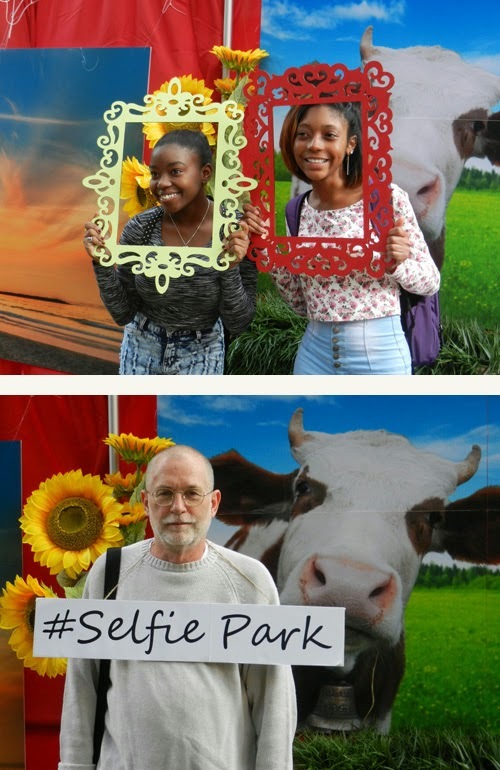 And for my favorite parking spot... Selfie Park, constructed by Langan Engineering at 17th and Chestnut Streets, allowing people to choose between two photo backdrops, a beach or pastoral scene, and have their picture taken with props. These two adorable girls were framed and Michael hanged. The Langan group chose this location not only for convenience, next to their company office, but also because it faced one of Philadelphia's best kept secrets, until now... John F. Collins Park at 1707 Chestnut Street. I can't believe I've walked past this little gem many times and never knew it existed. And while Selfie Park and the other "parklets" created for this event are temporary, dismantled at the end of the day, John F. Collins Park, approximately the size of a half-dozen parking spaces, is open year round. 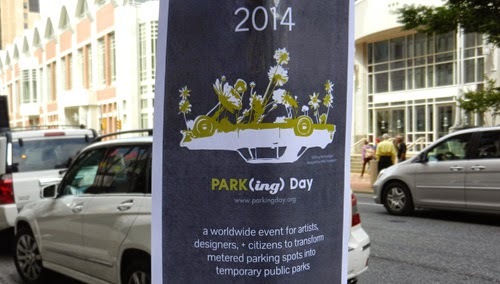 We're so looking forward to PARK(ing) Day 2015 and seeing even more parks than we did this year. Maybe we'll even consider creating a "parklet" of our own. What a cool idea! Philly certainly has a lot of inventive, fun and unusual happenings going on. Love the circular rocking chair! Have to agree with Michael on the pet peeve. Littering makes me crazy. When I used to walk Jasper around the neighborhood, I always carried a bag for trash and picked up all kinds of stuff that people threw on the ground. The bag was almost always full by the end of the walk. It would be a fun project for the two of you to do a parklet next year. I'm afraid I don't have any ideas yet but will let you know if I think of any.